We had the chance to practice some cursive when we reviewed PreScripts from Classical Conversations! Classical Conversations is a publisher of classical materials for homeschools and co-ops. Classical Conversations has multiple communities throughout the United States that operate co-ops, using materials from the publisher to promote a classically-driven education that focuses on memory work, chronological study of history, emphasizes skills such as cursive writing, logic, and public speaking. This book retails for $12.99 and is for ages 5-10. The book contains 145 pages of handwriting and drawing practice. The first pages of the book contain a sample upper and lower case cursive alphabet. Then the book is divided into 3 sections. The first page of each two-page spread contains a letter of the alphabet in upper and lower case script. Then there is a line to practice the upper case formation and a line below to practice the lower case letter. The following line contains practice writing a word that begins with that letter. The bottom half of the page contains scripture copywork of a scripture that contains the focus letter. The second page of the spread contains drawing practice with short instructions on how to complete the drawing section, such as completing curved lines to make different sized smiles on the page. This section contains practice for writing the name of each number in cursive (up to number 20). The bottom half of each page has a scripture that contains the number that is being practiced. There are a few drawing pages scattered throughout this section. This section gives the student practice for forming letter combinations such as “tw,” “iv,” “ex,” and “oe” that can be difficult when writing in cursive. The first portion of each page contain practice for writing each letter combination. The bottom half of the page has sections of the first book of James written out for the student to copy. By the end of this section, the student will have copied the entire first chapter of the book of James. We found that the amount of space on each line was not enough for Curly to completely copy all of the words on that line. She often ran out of room. She does not have overly large handwriting but she is still working to keep her letters small. Curly was frustrated that she could not fit all of her words on the lines like the sample above and no extra lines were provided at the bottom. I found the words to be copied to be very crowded with small spacing and small letters. We could definitely use more room! The book is comb-bound and is meant to have the comb along the top when you are looking at the book. This means that the comb is at the bottom of the top page when you are looking at the open book. When Curly was trying to write on the top page, her hand would be resting on the comb binding which made it difficult for her to write well. She found the binding to be bothersome as she was trying to write on the last lines of the top page. I think it would be better if the drawing pages were on the top and the handwriting pages on the bottom. I love that the book uses scripture to reinforce handwriting skills through copywork. What better material to read and copy than words from the Bible? I also like that the book is black and white and very simple with minimal drawings. This enabled Curly to focus on the handwriting without being distracted. Curly really enjoyed the drawing pages that were scattered throughout the book. They were motivating to her as I only allowed her to work on the drawing sections once she had completed her page of the copy work. We have really enjoyed using the PreScripts books to work on cursive. We are moving very slowly through the book but plan to keep using this resource to work on cursive. 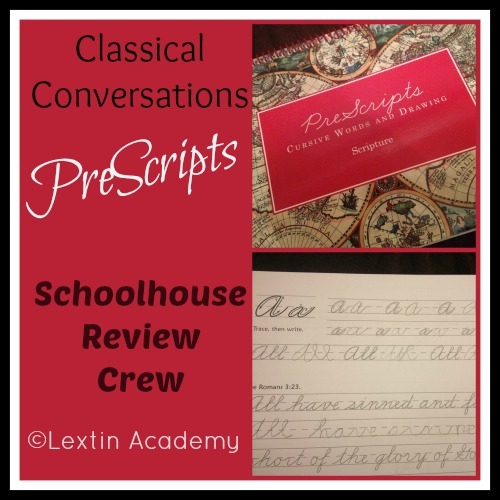 Enjoy reading more reviews at the Schoolhouse Review Crew blog!